MIAMI, FL, December 6, 2018 – Miami-based United American Corp (“UnitedCorp”) (OTC: UAMA) announced today that it has launched a suit for damages and injunctive relief against Bitmain, Bitcoin.com, Roger Ver, the Kraken Bitcoin Exchange and other individuals that are related to what is alleged to have been a well-planned scheme to take control of the Bitcoin Cash network for personal gain and which caused a global capitalization meltdown of the Bitcoin Cash network at the expense of others. Bitcoin Cash is one of the most important cryptocurrency networks that has been established in recent years. It is used for peer-to-peer electronic cash system between parties on the Bitcoin Cash network which are executed through a network of decentralized public ledgers which confirm and maintain the records of these digital transactions on a blockchain in a highly cryptographic environment. The integrity and confidence in the network is in part based on this decentralization as well as the operating principle that no single person or entity is able to control the majority of the network. Since confirmation and recording of transactions on the blockchain is undertaken by “consensus” of network nodes and since transaction ledgers are continuously being checked against each other, tampering with the ledgers is extremely difficult if not impossible since multiple ledgers would have to be tampered with in the same way and simultaneously. However if an entity controls more than 51% of a blockchain network, the network becomes susceptible to fraud including reversal of transactions and what is known as “double spending” – or spending the same cryptocurrency more than once. On November 15, 2018 the Bitcoin Cash network underwent an upgrade using the Bitcoin ABC 0.18.4 implementation. 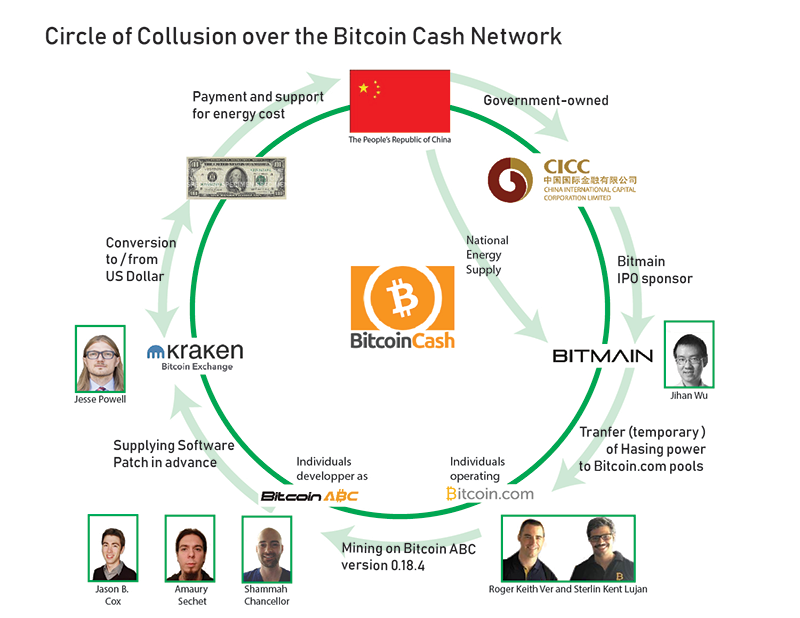 UnitedCorp alleges that the defendants took control of the Bitcoin Cash network immediately after the November 15th software upgrade against all principles and protocols of the blockchain, through the use of “rented hashing” – the process of artificially and temporarily deploying or redirecting computing power to take control of the network and used this computer power to favor the adoption of the Bitcoin ABC new rule sets over other implantations that would have maintained democratic rule sets. Once the Bitcoin ABC rule set was established, it became the dominant chain and the rented hashing was withdrawn and was no longer contributing to the Bitcoin Cash network. UnitedCorp alleges that the use of computational hashing power that did not contribute to the network just prior and then was withdrawn shortly after the network upgrade was put in place for the sole purpose of maintaining an artificially longer chain over the existing rule sets and amounted to human manipulation for the purpose decentralizing the autonomous network and that this was orchestrated by a small group of individuals and corporations.